The Bible is about Jesus, the Saviour of the world. Jesus is pictured or prophesied about in each of the 66 books of the Bible as well as in countless types in the lives of different characters in the Bible. The ‘scarlet thread’ or the blood of Christ runs through Genesis to Revelation. 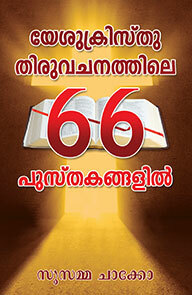 JESUS CHRIST THROUGH THE 66 BOOKS OF THE BIBLE (MALAYALAM) gives a breakdown of how he is pictured in each of the books in detail. Jesus is the hero and the main character of history. The book is an outcome of the author’s, Susamma Chacko, devotional studies. As you go through the pages of the book your devotion to Christ and knowledge about Christ will increase. It is worth reading.